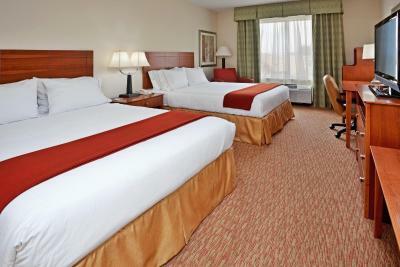 Lock in a great price for Holiday Inn Express Hotel & Suites Greensboro - Airport Area – rated 8.6 by recent guests! The staff was polite. The breakfast was good, well equipped. The employee that managed the breakfast setup/service was phenomenal! The staff was very friendly. The pillows were great. The ease of check in, we needed to change the length of stay at the last minute and they were very accommodating. Breakfast was awesome! 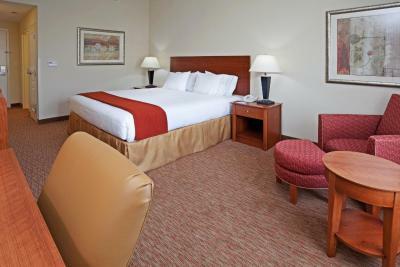 Holiday Inn Express Hotel & Suites Greensboro - Airport Area This rating is a reflection of how the property compares to the industry standard when it comes to price, facilities and services available. It's based on a self-evaluation by the property. Use this rating to help choose your stay! 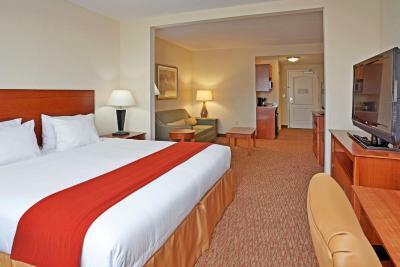 This Greensboro Holiday Inn is just off I-40 and 6 miles from the Piedmont Triad International Airport. The hotel features an outdoor pool and an airport shuttle. 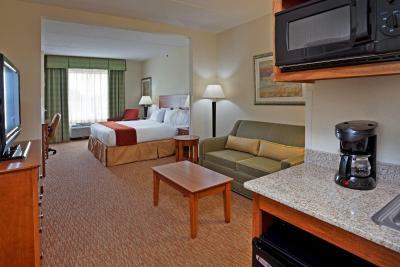 Rooms at Holiday Inn Express Hotel & Suites Greensboro - Airport Area have cable TV and free Wi-Fi. They are equipped with a microwave and a dishwasher. 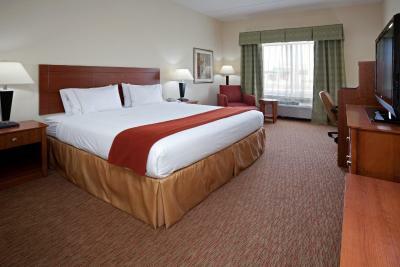 The Greensboro Holiday Inn Express Hotel & Suites has a business center, as well as a modern fitness center. The front desk is staffed 24 hours a day. The Greensboro Children’s Museum is 13 miles from Holiday Inn Express Hotel & Suites Greensboro - Airport Area. Downtown Greensboro is an 18-minute drive away. This property is also rated for the best value in Greensboro! Guests are getting more for their money when compared to other properties in this city. 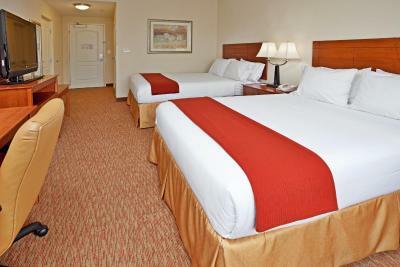 When would you like to stay at Holiday Inn Express Hotel & Suites Greensboro - Airport Area? Bed type is determined upon check-in and based on availability. Room comes with a microwave, small refrigerator and flat-screen cable TV. Suite has sitting area with sofa bed, a microwave and a small refrigerator. Room comes equipped with a microwave, a small refrigerator and a flat-screen cable TV. Includes a combination bathtub and shower. This suite features 2 flat-screen cable TVs, sofa bed, and kitchenette. Room is equipped with a microwave, a small refrigerator and a flat-screen cable TV. Includes a roll-in shower. Room comes equipped with a microwave, a small refrigerator and a flat-screen cable TV. Includes a walk-in shower. 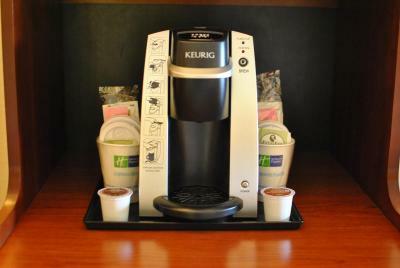 House Rules Holiday Inn Express Hotel & Suites Greensboro - Airport Area takes special requests – add in the next step! Holiday Inn Express Hotel &amp; Suites Greensboro - Airport Area accepts these cards and reserves the right to temporarily hold an amount prior to arrival. Holiday Inn Express Hotel & Suites Greensboro - Airport Area accepts these cards and reserves the right to temporarily hold an amount prior to arrival. Some of the appliances were inconsistent. The heat ,television and hot water had a mind of their own. Perfectly located for our purpose in NC. Good selection of breakfast food. Price and a broken tile in the bathroom. Location was a little further out but not bad. Room key quit working each day! Desk staff said a new system was going to be installed soon. Nice, clean rooms. Very good breakfast!